Returns a 32-bit IPv4 address, commonly used to map hostnames to an IP address of the host. Returns a 128-bit IPv6 address, commonly used to map hostnames to an IP address. Location of database servers of an AFS cell. 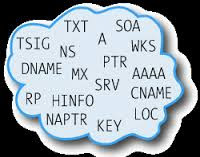 This record is commonly used by AFS clients to contact AFS cells outside their local domain. Stores information like PKIX, SPKI, PGP, etc. Used in conjunction with the FQDN option to DHCP. DNAME will delegate an entire portion of the DNS tree under a new name. The record used to identify the DNSSEC signing key of a delegated zone. Method of separating the end-point identifier and locator roles of IP addresses. Key record that can be used with IPSEC. Specifies a geographical location associated with a domain name. Maps a domain name to a list of mail exchange servers for that domain. Delegates a DNS zone to use the given authoritative name servers. Part of DNSSEC—used to prove a name does not exist. Uses the same format as the (obsolete) NXT record. Parameter record for use with NSEC3. Signature for a DNSSEC-secured record set. Uses the same format as the SIG record. Signature record is used in SIG. Resource record for publishing SSH public host key fingerprints in the DNS System, in order to aid in verifying the authenticity of the host. Originally for arbitrary human-readable text in a DNS record. Since the early 1990s, however, this record more often carries machine-readable data, opportunistic encryption, Sender Policy Framework (deprecated), DomainKeys, DNS-SD, etc.